Maja Johnson (Biology, Class of 20 13) started researching with Amanda Nienow, professor of chemistry, during the fall of her sophomore year. Although she plans on pursuing a health related career such as public health, or becoming a physician or physician’s assistant, Johnson decided to research in order to build her lab technique and critical thinking skills. “I love science and it’s an incredible opportunity to immerse yourself in something with out a set answer; to explore different areas,” said Johnson. The unknown aspects of research force students to think through their experiments carefully, and when their results do not turn out they way they expected, students and their professors try to figure out why. 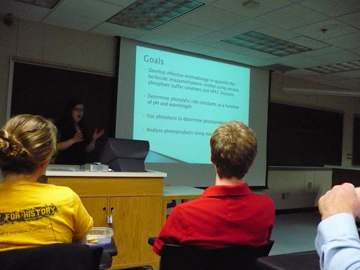 Maja Johnson presents her findings at a weekly Summer Research Meeting. 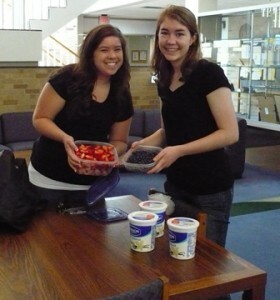 Labmates Maja Johnson (left) and Megan Crow (right) set up a yogurt parfait bar for summer researchers' Friday snack time.